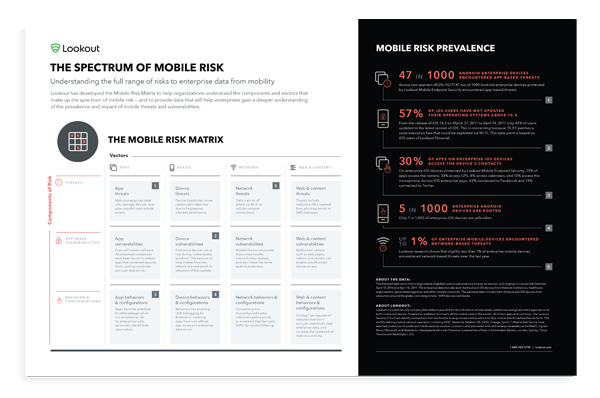 Today, Lookout is introducing The Spectrum of Mobile Risk research report, and the Mobile Risk Matrix to help security organizations understand the range of risks to enterprise data from mobility, and to provide data that demonstrates the prevalence of those risks. Mobile devices are a part of every enterprise’s critical infrastructure. Employees use them every day to work. These devices access significant amounts of sensitive data and act as a conduit, transporting that data off the device through email and applications. Threats, vulnerabilities, and other risks to data that affect PCs also apply to mobile endpoints, yet simply extending current PC security controls to mobile is ineffective. Security professionals must redefine their approach to risk management in the mobile world, and architect mobile-specific security. That is why we're introducing the Mobile Risk Matrix today, to assist security organizations to enable their employees to get the most value from mobile technology, securely. In order to create the Mobile Risk Matrix, our Security Intelligence Team analyzed data from Lookout's uniquely massive global dataset of mobile code, device software, web, and network attacks compiled from both enterprise and personal active users, together with our ten years of research into mobile risks. The Mobile Risk Matrix is organized into 12 elements; 3 components of risk and 4 vectors, seen in the image above. How are you measuring the risk from each element of the matrix in your current environment? Then ask how you are controlling for that element of your mobile risk? Most security organizations will find that they have very limited visibility into most mobile risks, and are similarly limited in how to control these risks with existing solutions. The first step towards mitigating mobile risk is to acknowledge that the world has changed and your security needs to change with it. The next step is to understand the spectrum of mobile risk so you can implement the right strategy to protect your data. To learn how the Spectrum of Mobile Risk will help you protect your data, get a copy of the The Spectrum of Mobile Risk research paper today.